"Violet, you are my kitten sister and I love that you like to sit in my bed and do purring. I know you like my fish mobile up there on the ceiling. I can get you your own mobile or something. Wait. I know just what you should have. Hey Mom? Mom? Can I get a poster of turkey lunch meat? You will love that, Vi. You very will." The boy. He's such a compassionate heart. Oh Sweet Violet. It was your lucky day when you landed in the House O' Bob. Awww, the House O' Bob is the best place on earth. Did you have a happy birthday? I hope so. What did Bob Rosenberg give you? Let us know how you can keep turkey lunch meat attached to a mobile. LOL! The simple genius of a child. Why didn't I think of lunchmeat posters?? I just caught one of my sons hanging up pictures on his wall--"framing" them in duct tape. (made his daddy proud) "It's like silver frames Mom, only better 'cause they won't fly off when I shoot 'em with my nerf gun!" Does he want an 8x10 or a 16x20? Vi is a lucky kitty. 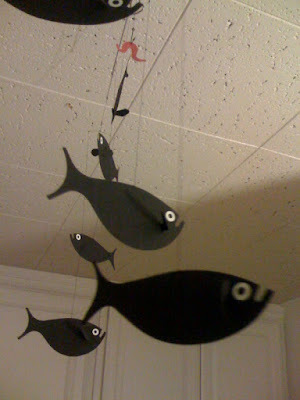 I like the fish mobile! This post stopped my heart for a moment - it was that lovely. Bob is wonderful! Only Bob...lunchmeat posters for cats...brilliant! Lisa, I have to say that I've been reading (and loving) your blog for some time now. I check back often, looking for new posts, so I've become familiar with your face. I swear I thought I saw you on tv today. There was a girl playing a dentist on a Crest 3D Whitening commercial who looks IDENTICAL to you!! I couldn't believe just how much she reminded me of you! !